Acting is no easy task. Crafting a believable character and fully inhabiting a role takes expert skill and talent under any circumstances. But what if successfully pulling off a convincing performance meant much more than just Oscar consideration? What if it meant the difference between life and death? Such is the case with Robert Mazur. As an undercover government agent entrenched in a deadly drug cartel, one missed line or questionable delivery could result in a bullet to his head. A tense yet rather generic crime thriller, 'The Infiltrator' exposes Mazur's harrowing story, offering a periodically engaging tale of fake identities, tested loyalties, and increasing paranoia -- all held together by a life-saving performance from Bryan Cranston. Based on a true story, the film focuses on U.S. Customs special agent Robert Mazur (Bryan Cranston) as he attempts to infiltrate Pablo Escobar's criminal organization in the 1980s. Posing as a businessman named "Bob Musella," Mazur works his way into the infamous drug lord's money-laundering operation, gradually integrating himself into the process. But the deeper he goes, the more dangerous the situation becomes. With the threat of exposure lurking at every corner, Mazur races to collect the evidence he needs before his cover is blown. On the one hand, we have Robert Mazur, a hard-working family man dedicated to putting criminals away. On the other, we have Bob Musella, a colorful businessman rooted in corrupt dealings and illegal enterprises. And bringing them both to life, we have Bryan Cranston, imbuing the film's two precariously balancing personas with an appropriate level of calm determination and escalating anxiety. As Mazur, Cranston portrays a steadfast, straight-laced man of principles. As Musella (or more correctly, as Mazur being Musella), he adds a bit more flavor to the proceedings, delicately playing up his wheeling and dealing demeanor as he schmoozes his way into Escobar's crime family. To this end, much of the runtime focuses on various meetings, dinners, and phone calls tied to Musella's gradual infiltration, all interspersed with clandestine encounters between Mazur and the government as he secretly builds his case against the drug dealers and bankers he's simultaneously befriending. All the while, the danger of leading a double life begins to take its toll, and the movie ultimately draws some effective drama from the character's increasing anxiety, paranoia, and confused loyalties. Beyond psychological distress, the film also offers a few potent bursts of action, paying off the narrative's building tension with sometimes explosive violence. Stylistically, director Brad Furman filters all the gunshots and deal-makings through a gritty lens marked by high contrast visuals and a convincing 1980s aesthetic. A few slick montages help to move us through the money-laundering process while slow zooms and Steadicam shots enhance building suspense and close-ups accentuate details involved in the minutia of undercover work. One extended take near the climax is especially noteworthy, following Mazur as he moves from a surveillance room with his government boss to greeting his criminal friends elsewhere in the building in one unbroken sequence -- allowing the camera to connect all the moving pieces of the operation without interruptions. With that said, many elements of the movie's visual and narrative construction feel disappointingly familiar and generic, explicitly evoking similar shots, plot points, and character beats from better crime flicks like 'Goodfellas,' 'Donnie Brasco,' 'Scarface,' 'The Godfather,' 'The Departed,' and countless others. Likewise, the story and characterizations can be a bit clichéd, the plot progression is clunky, and various elements of Mazur's operation are skimmed over and underdeveloped. The script is solid enough, but it never really finds a unique or particularly fleshed out take on the numerous genre tropes it appropriates. By the time the credits roll, audiences will likely feel like they've seen this all done many times before -- and usually better. 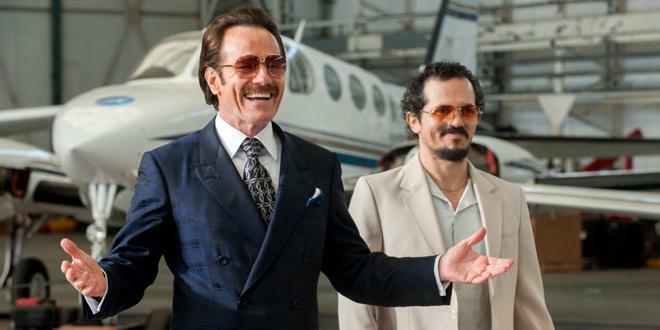 'The Infiltrator' is a decent yet forgettable undercover thriller. Though there are some tense and affecting moments, the runtime never finds an effective voice of its own, mixing the script's true story origins with too many crime flick clichés and overused stylistic flourishes. Cranston gives a strong performance as Mazur and Musella -- but ultimately, neither Bob ends up leaving a particularly lasting impression. 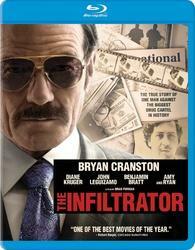 Broad Green Pictures presents 'The Infiltrator' on a BD-50 Blu-ray disc housed in a keepcase. After some skippable trailers, the disc transitions to a standard menu. The packaging indicates that the release is region A coded. The movie is provided with a 1080p/AVC MPEG-4 transfer in the 2.40:1 aspect ratio. Intentionally stylized to offer a high contrast, 80s aesthetic, the movie comes to Blu-ray with a strong transfer. Shot on the Red Epic Dragon, the digital source features a moderate to heavy layer of artificial grain, helping to evoke a gritty 1980s look. Clarity is strong, offering a sharp image with distinct fine textures, detailed close-ups, and pleasing depth. The color palette adheres to a mostly warm and slightly over-saturated look, resulting in a punchy yet occasionally harsh appearance that is often tinged in yellow and orange hues. Club scenes are especially noteworthy, offering an impressive display of neon lights that pop from the screen. Contrast is intentionally high with blown out whites and solid black levels, and while this choice does obscure detail in some shots, the style works nicely with the story's tone and setting. Though the film's chosen aesthetic can lead to comparatively harsh color grading and contrast levels, these aggressive visual flourishes suit the content well, rounding out a bold and impressive image. The film is presented with an English DTS-HD MA 5.1 track, along with optional English SDH and Spanish subtitles. Marked by solid ambience and a few more aggressive set pieces, this is a very solid mix. Dialogue is clear and well prioritized throughout, allowing every conversation (secretly recorded or otherwise) to come through without any issues. General atmosphere is fitting throughout as well, bringing appropriate effects to various offices, bars, and clubs. That latter location also carries some appropriately heavy LFE. With that said, the track can be a bit front-loaded, with only soft echoes of ambience hitting the surrounds in most instances. Thankfully, the mix does perk up rather nicely during the film's tenser moments and action heavy scenes, bringing some powerful kick and immersion to car crashes, rain storms, gun shots, and explosions with wide dynamic range. Likewise, the movie's score and selection of 80s rock tunes sounds fantastic, presenting each track with strong separation and full-bodied fidelity. With a mix of quieter dialogue-heavy scenes, thumping music tracks, and a few potent bursts of action, 'The Infiltrator' hits Blu-ray with a versatile and fairly enveloping audio presentation. Commentary – Director Brad Furman and star Bryan Cranston sit down together for this track. The pair offer a laidback and steady discussion, touching upon a wide range of production trivia, including details on locations, sets, music, casting, budgetary concerns, challenges faced during the shoot, influences, improvisation, and deviations from the real story that inspired the script, rounding out a very informative commentary. Deleted Scenes (HD, 9 min) – Five deleted scenes are viewable separately or together in 1080p with Dolby Digital 2.0 sound. These bits mostly serve to expand upon Mazur's attempts to get money from the government, along with scenes that add a bit more tension and paranoid drama. The Three Bobs (HD, 3 min) – This featurette includes interviews with Bryan Cranston and the real Bob Mazur as they discuss Bob's different personas. How to Infiltrate (HD, 6 min) – Here we get a brief three-part featurette viewable separately or together, expanding upon different aspects of undercover work (psychology, identity, danger) with the cast and real life people who inspired the story. 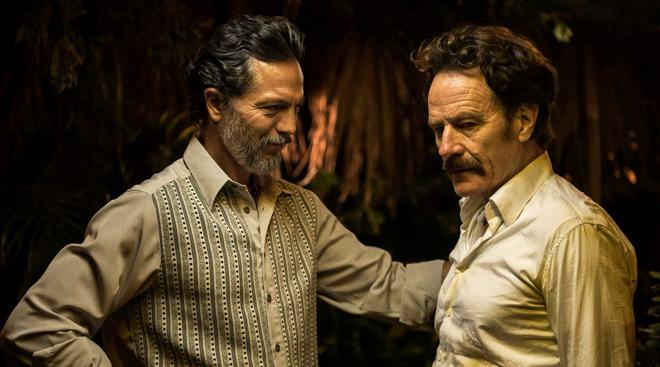 Brad Furman's 'The Infiltrator' is a periodically engaging yet disappointingly familiar undercover thriller. The video transfer is very strong, preserving the movie's gritty, stylized visuals. Likewise, the audio track offers a nice mix of subtle atmosphere and aggressive kick. Though the included featurettes are pretty brief, the commentary track is full of thoughtful production insights. The movie fails to fully live up to the many similar genre efforts it frequently evokes, but this disc is still worth a look.